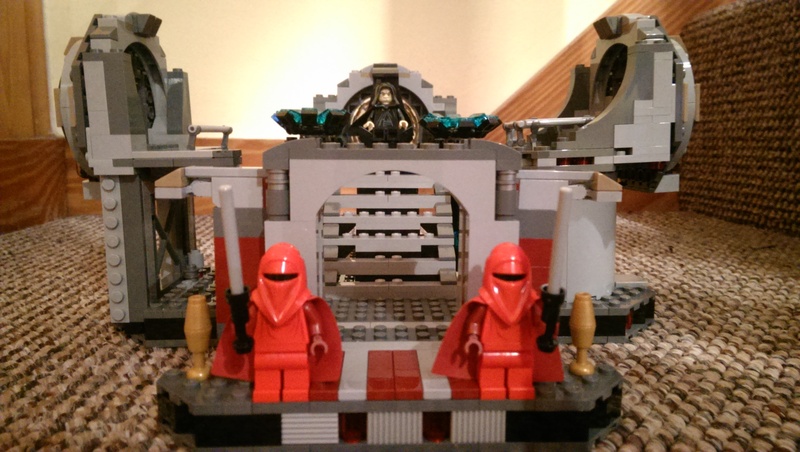 I’m back with another LEGO Star Wars review today and this one is pretty special I must say. 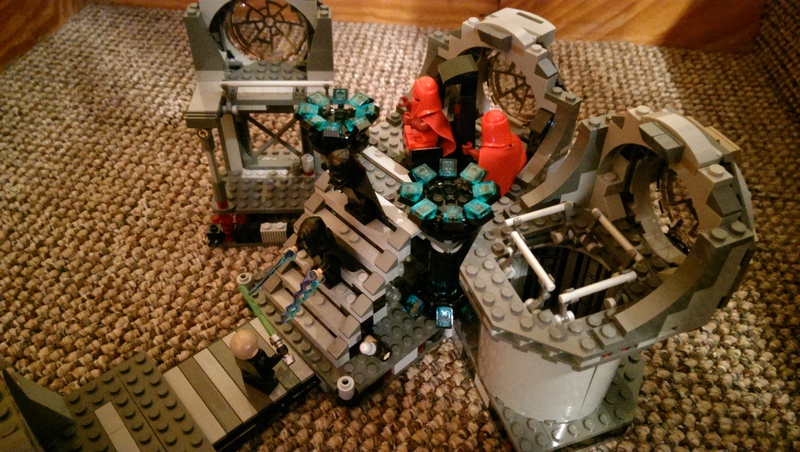 Set number 75093-Death Star Final Duel was recently released as part of the June summer wave along with four other sets. It is also the only playset of the wave; all the others being vehicles from the Star Wars saga. 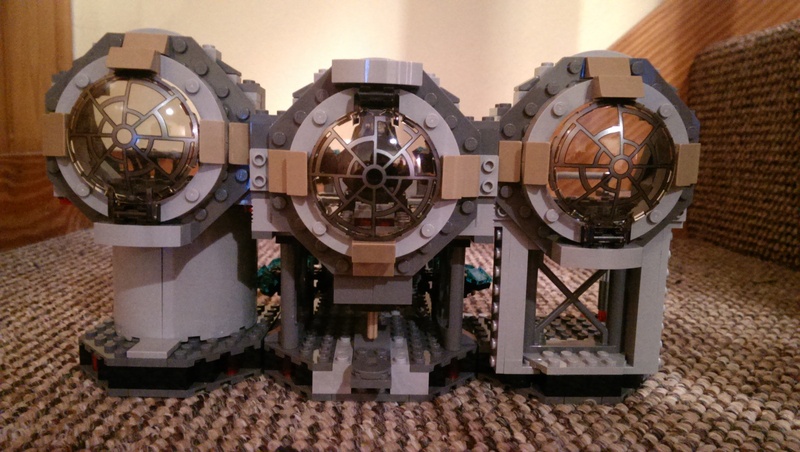 More to come on those throughout the month–right now I want to show you around this amazing LEGO set. 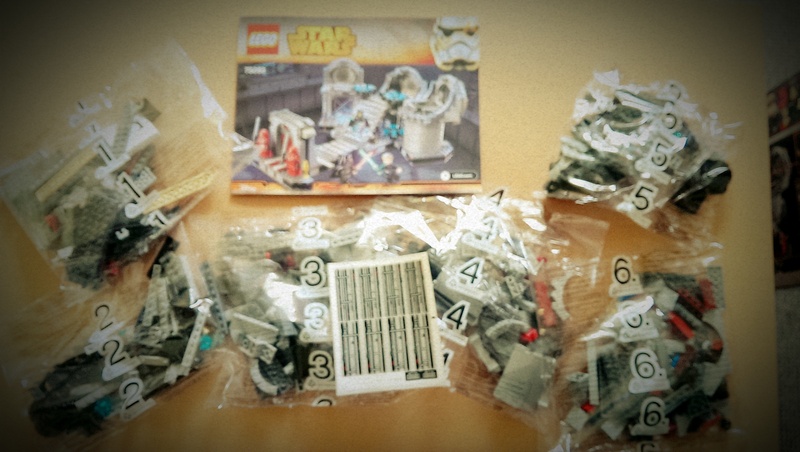 The set comes packaged in a large box–included in the box we have the instruction manual which has 106 pages. The set is separated into six bags and also includes a sticker sheet with ten stickers ready to use. It appears the Death Star was not finished on schedule. The Emperor is most displeased! 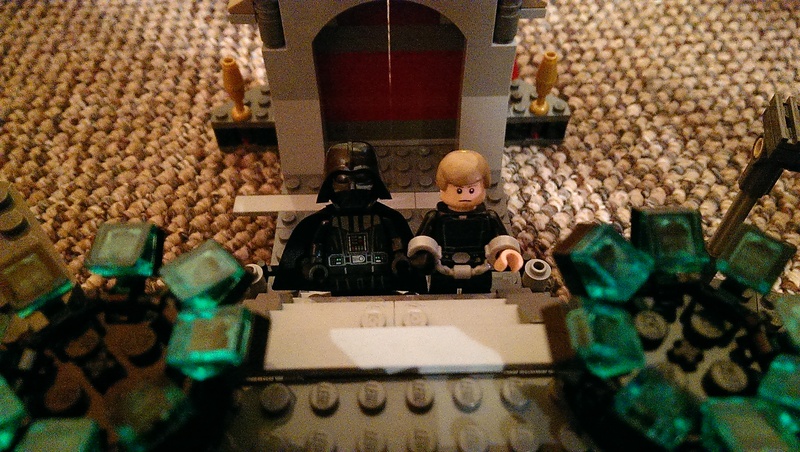 Lord Vader arriving to update his Master on the progress! Wait! That’s not Sheev! Where’s Sheev? Who said Royal Guards couldn’t have fun? The Build: The build in general is rather fun. Each individual bag adds the next section to the throne room starting with the extending corrido andr working around the set and back to the doorway. There are some complex parts to the build that require a sturdy hand but nothing that can’t be overcome, there are also some fairly repetitive parts (i.e the three observation windows are identical in construction and the blue control panels are also exactly the same). 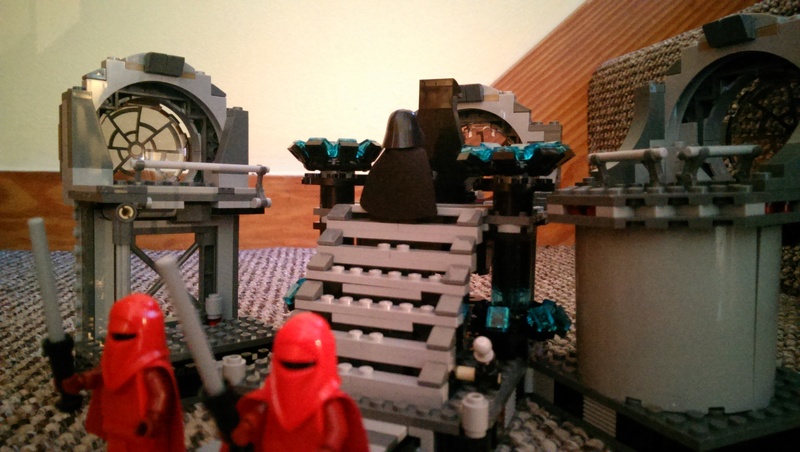 Negatives aside, this is a fun build, as you can see it all coming together with each bag and by the end of the build you really feel like you’re back in the Emperor’s throne room from Return of the Jedi. This set come with tons of playability features, so many that you can recreate most of the action sequences from the final duel in Jedi. 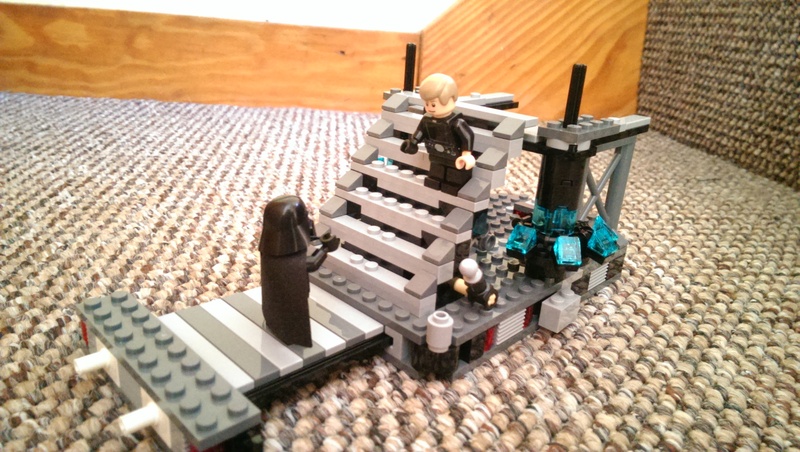 Starting at the entrance to the set you have an opening double door that leads on through to an extendable platform that has a flip panel inserted in order to flip your minifigures into the abyss. 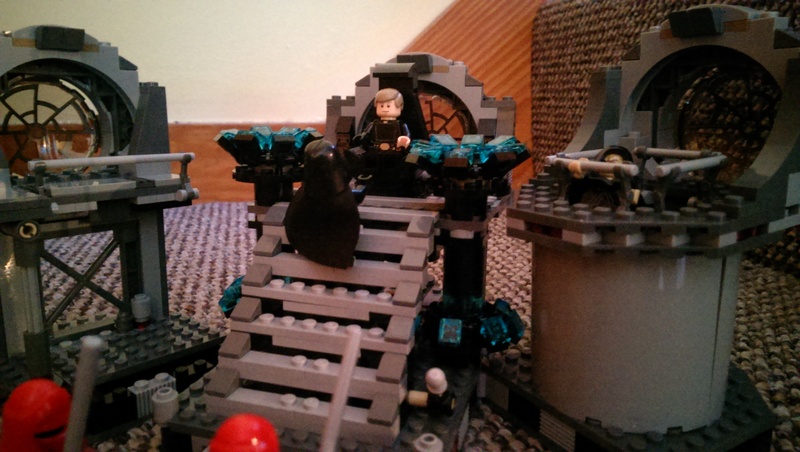 Moving up the stairs there is another feature that allows you to flip the stairs and throw your minifigures as if they’re being aggressively Force-pushed. 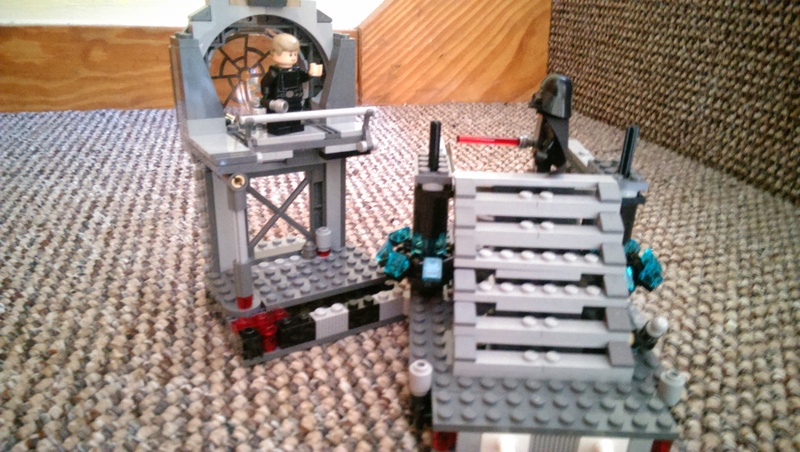 The far observation window on the right in the image above has another platform that at the flick of a finger allows you to collapse it and recreate that famous scene where Vader throws his saber towards Luke, destroying the platform! Behind the centre window you have the Emperor’s throne which is sitting on a swivel device, just behind the throne is Sheev’s lightsaber which is inserted into the floor, this saber can be flicked up out of hiding by pushing down on a device on the underneath of the centre window. Moving onto the far left observation window, behind this you have the deep dark shaft in which Vader throws the Emperor into and in doing so redeems himself; in this shaft is where you you’ll find the stickers I mentioned earlier. And last but not least, the whole set can be opened and closed for display and play purposes, you can see the set closed in the image below. 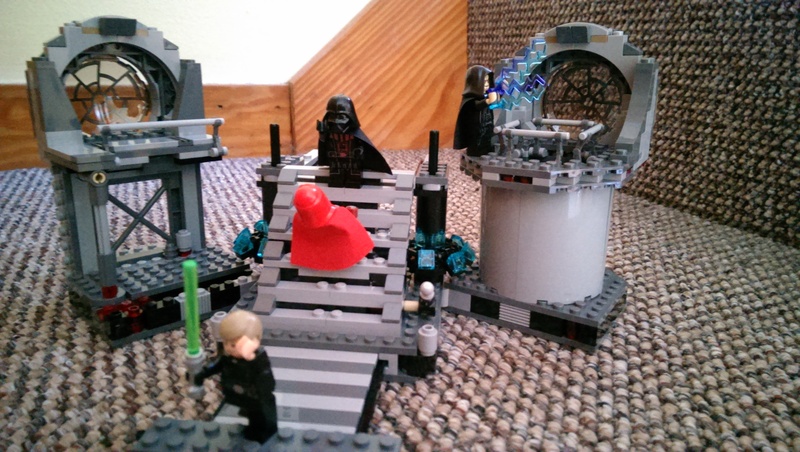 This set includes five minifigures with Luke Skywalker, Darth Vader, Emperor Palpatine, and two royal guards. 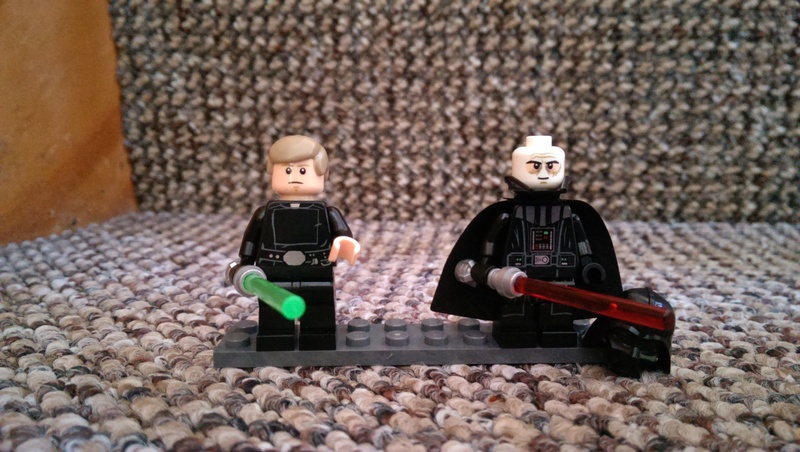 All five figures are great with amazing detail on the faces and bodies; however one minifigure steals the show here and that is Darth Vader himself. This Vader is unbelievably accurate to the films and is only the second ever Vader design since the LEGO company acquired the Star Wars license back in 1999. This is pretty crazy considering Vader is the most iconic character and most of the other minifigures have had re-designs in the past. Vader’s helmet finally comes in two pieces–I’d imagine this was done to be more movie-accurate as this is the film when Luke finally removes his father’s mask. Not only is his helmet a re-design, but his facial colouring is also re-done: he now has the pale white tone seen in the films (note: LEGO also added the special edition eyebrows to this minifigure). 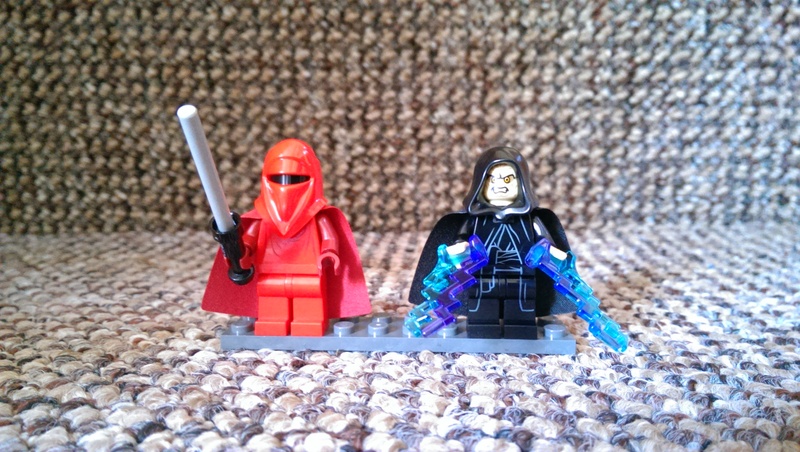 I genuinely can’t say enough about the minifigure and to be completely honest it made the set for me! Take a look at the figures below. 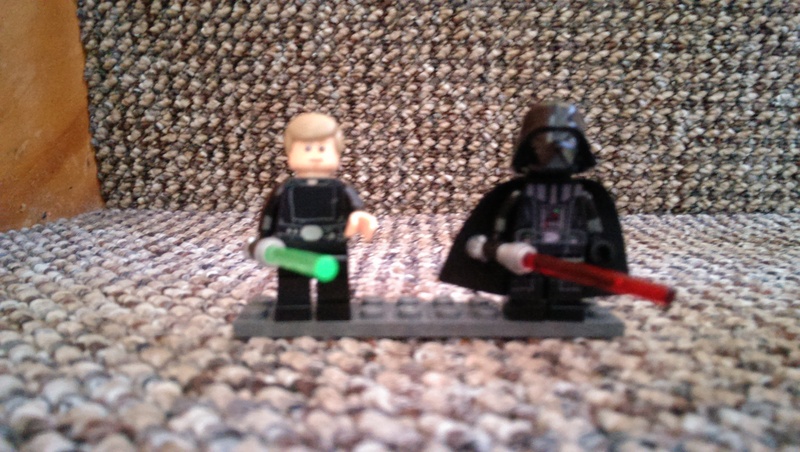 Luke Skywalker & re-designed Darth Vader. Luke also comes with a double sided face printing. 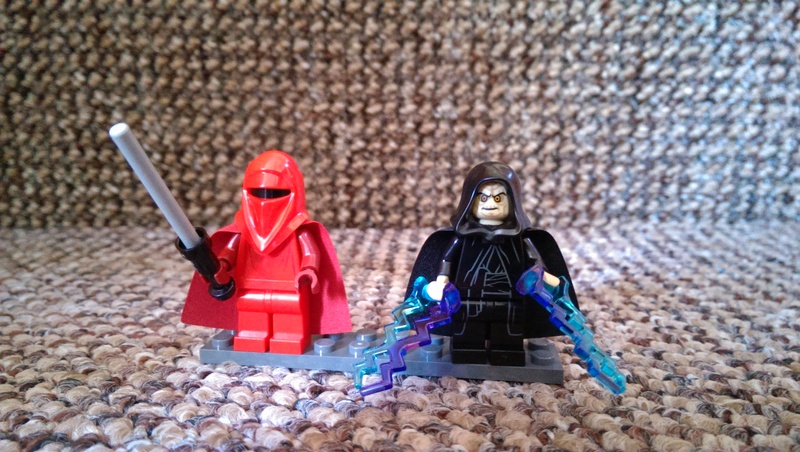 Both Royal Guard figures are identical. The Emperor comes with a double-sided face both of which are shown above. I think this is a truly fantastic set which exceeds expectations. Not only does it allow you to recreate scenes from Jedi in almost an identical manner, but it allows you to let your imagination run wild in a location that is so iconic. With an enormous amount of playability and what I now consider the best minifigure ever designed in Darth Vader this set is a must purchase for collectors and kids alike. Well done, LEGO!